Safed (Hebrew: צְפַת Tsfat, Ashkenazi: Tzfas, Biblical: Ṣǝp̄aṯ; Arabic: صفد‎, Ṣafad) is a city in the Northern District of Israel. Located at an elevation of 900 metres (2,953 ft), Safed is the highest city in the Galilee and in Israel. Due to its high elevation, Safed experiences warm summers and cold, often snowy, winters. Safed has been identified with Sepph, a fortified town in the Upper Galilee mentioned in the writings of the Roman-Jewish historian Josephus. The Jerusalem Talmud mentions it as one of five elevated spots where fires were lit to announce the New Moon and festivals during the Second Temple period. In the 12th century CE Safed was a fortified city in the Crusaders' Kingdom of Jerusalem, known to them as Saphet. The Mamluk Sultan Baibars captured the city in 1266 and appointed a governor to take charge of the fortress. The city also became the administrative centre of Mamlakat Safad, a province in Mamluk Syria whose jurisdiction included the Galilee and the lands up to Jenin. Under the Ottomans, Safed functioned as the capital of the Safad Sanjak, which encompassed much of the Galilee and extended to the Mediterranean coast. Since the 16th century, Safed has been considered one of Judaism's Four Holy Cities, along with Jerusalem, Hebron and Tiberias; since that time the city has remained a centre of Kabbalah and Jewish mysticism. Rabbi Isaac Luria introduced interest in the Kabbalah to the city in the 16th century. Due to its mild climate and scenic views, Safed has become a popular holiday resort frequented by Israelis and by foreign visitors. In 2017 it had a population of 35,276. Legend has it that Safed was founded by a son of Noah after the Great Flood. According to the Book of Judges (Judges 1:17), the area where Safed is located was assigned to the tribe of Naphtali. It has been suggested that Jesus' assertion that "a city that is set on a hill cannot be hidden"  may have referred to Safed. Safed has been identified with Sepph, a fortified town in the Upper Galilee mentioned in the writings of the Roman-Jewish historian Josephus. It is mentioned in the Jerusalem Talmud as one of five elevated spots where fires were lit to announce the New Moon and festivals during the Second Temple period. There is scarce information about the town of Safed prior to the Crusader conquest in 1099. The city appears in Jewish sources in the late Middle Ages. [clarification needed] In the 12th century, Safed was a fortified city in the Crusaders' Kingdom of Jerusalem, known by the Crusaders as Saphet. King Fulk built a strong castle there on a steep hill, which was kept by the Knights Templar from 1168. Benjamin of Tudela, who visited the town in 1170, does not mention any Jews as living there. The remains of this castle can now be found under the "citadel" excavations , on a hill above the old city. Safed was captured by the Ayyubids led by Saladin in 1188 after one year's siege, following the Battle of Hattin in 1187. Saladin ultimately allowed its residents to relocate to Tyre. Samuel ben Samson, who visited the town in 1210, mentions the existence of a Jewish community of at least fifty there. In 1227, the Ayyubid emir of Damascus, al-Mu'azzam 'Isa, had the Safed castle demolished to prevent it being captured and reused by potential future Crusades. In 1240, Theobald I of Navarre, on his own Crusade to the Holy Land, negotiated with the Ayyubids of Damascus and of Egypt[clarification needed] and finalized a treaty with the former against the latter whereby the Kingdom of Jerusalem regained Jerusalem itself, plus Bethlehem and most of the region of Galilee, including Nazareth and Safed. The Templars thereafter rebuilt the town's fortress. 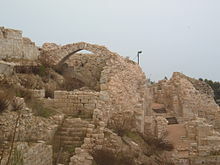 In 1260, the Mamluk sultan Baybars declared the treaty invalid due to the Christians working in concert with the Mongol Empire against the Muslims, and launched a series of attacks on castles in the area, including on Safed. In 1266, during a Mamluk military campaign to subdue Crusader strongholds in Palestine, Baybars captured Safed in July, following a failed attempt to capture the Crusaders' coastal stronghold of Acre. Unlike the coastal Crusader fortresses, which were demolished upon their capture by the Mamluks, Baybars spared Safed from destruction. Instead, he appointed a governor to be in charge of the fortress. Baybars likely preserved Safed because he viewed its fortress to be of high strategic value due to its location on a high mountain and its isolation from other Crusader fortresses. Moreover, Baybars determined that in the event of a renewed Crusader invasion of the coastal region, a strongly fortified Safed could serve as an ideal headquarters to confront the Crusader threat. In 1268, he had the fortress repaired, expanded and strengthened. Furthermore, he commissioned numerous building works in the town of Safed, including caravanserais, markets, baths, and converted the town's church into a mosque. By the end of Baybars' reign, Safed had become the site of a prospering town, in addition to its fortress. The city also became the administrative centre of Mamlakat Safad, a province in Mamluk Syria whose jurisdiction included the Galilee and the lands further south down to Jenin. According to al-Dimashqi, who died in Safed in 1327, writing around 1300, Baybars built a "round tower and called it Kullah ..." after levelling the old fortress. The tower is built in three stories. It is provided with provisions, and halls, and magazines. Under the place is a cistern for rain-water, sufficient to supply the garrison of the fortress from year's end to year's end. According to Abu'l Fida, Safed "was a town of medium size. It has a very strongly built castle, which dominates the Lake of Tabariyyah. There are underground watercourses, which bring drinking-water up to the castle-gate...Its suburbs cover three hills... Since the place was conquered by Al Malik Adh Dhahir [Baybars] from the Franks [Crusaders], it has been made the central station for the troops who guard all the coast-towns of that district." Under the Ottomans, Safed was the capital of the Safad Sanjak, which encompassed much of the Galilee and extended to the Mediterranean coast. This sanjak was part of the Eyalet of Damascus until 1660, when it was united with the sanjak of Sidon into a separate eyalet, of which it was briefly the capital. Finally, from the mid-19th century it was part of the vilayet of Sidon. The orthodox Sunni courts arbitrated over cases in 'Akbara, Ein al-Zeitun and as far away as Mejdel Islim. In 1549, under Sultan Suleiman the Magnificent, a wall was constructed and troops were stationed to protect the city. During the early Ottoman period from 1525 to 1526, the population of Safed consisted of 633 Muslim families, 40 Muslim bachelors, 26 Muslim religious persons, nine Muslim disabled, 232 Jewish families, and 60 military families. In 1553–54, the population consisted of 1,121 Muslim households, 222 Muslim bachelors, 54 Muslim religious leaders, 716 Jewish households, 56 Jewish bachelors, and 9 disabled persons. Safed was the centre of Safad Subdistrict. According to a census conducted in 1922 by the British Mandate authorities, Safed had a population of 8,761 inhabitants, consisting of 5,431 Muslims, 2,986 Jews, 343 Christians and others. Safed remained a mixed city during the British Mandate for Palestine and ethnic tensions between Jews and Arabs rose during the 1920s. With the eruption of the 1929 Palestine riots, Safed and Hebron became major clash points. In the Safed massacre 20 Jewish residents were killed by local Arabs. Safad was included in the part of Palestine allocated for the proposed Jewish state under the United Nations Partition Plan for Palestine. By 1948, the city was home to around 1,700 Jews, mostly religious and elderly, as well as some 12,000 Arabs. On 5 January 1948, Arabs attacked the Jewish Quarter. In February 1948, during the civil war, Muslim Arabs attacked a Jewish bus attempting to reach Safed, and the Jewish quarter of the town came under siege by the Muslims. British forces that were present did not intervene. According to Martin Gilbert, food supplies ran short. "Even water and flour were in desperately short supply. Each day, the Arab attackers drew closer to the heart of the Jewish quarter, systematically blowing up Jewish houses as they pressed in on the central area." On April 16, the same day that British forces evacuated Safed, 200 local Arab militiamen, supported by over 200 Arab Liberation Army soldiers, tried to take over the city's Jewish Quarter. They were repelled by the Jewish garrison, consisting of some 200 Haganah fighters, men and women, boosted by a Palmach platoon. The Palmach ground attack on the Arab section of Safed took place on 6 May, as a part of Operation Yiftah. The first phase of the Palmach plan to capture Safed, was to secure a corridor through the mountains by capturing the Arab village of Birya. The Arab Liberation Army had plans to take over the whole city on May 10 and to slaughter all as cabled by the Syrian commander al-Hassan Kam al-Maz, and in the meantime placed artillery pieces on a hill adjacent to the Jewish quarter and started its shelling. The Third Battalion failed to take the main objective, the "citadel", but "terrified" the Arab population sufficiently to prompt further flight, as well as urgent appeals for outside help and an effort to obtain a truce. The secretary-general of the Arab League Abdul Rahman Hassan Azzam stated that the goal of Plan Dalet was to drive out the inhabitants of Arab villages along the Syrian and Lebanese frontiers, particularly places on the roads by which Arab regular forces could enter the country. He noted that Acre and Safed were in particular danger. However, the appeals for help were ignored, and the British, now less than a week away from the end of the British Mandate of Palestine, also did not intervene against the second – and final – Haganah attack, which began on the evening of 9 May, with a mortar barrage on key sites in Safed. Following the barrage, Palmach infantry, in bitter fighting, took the citadel, Beit Shalva and the police fort, Safed's three dominant buildings. Through 10 May, Haganah mortars continued to pound the Arab neighbourhoods, causing fires in the marked area and in the fuel dumps, which exploded. "The Palmah 'intentionally left open the exit routes for the population to "facilitate" their exodus...' " According to Gilbert, "The Arabs of Safed began to leave, including the commander of the Arab forces, Adib Shishakli (later Prime Minister of Syria). With the police fort on Mount Canaan isolated, its defenders withdrew without fighting. The fall of Safed was a blow to Arab morale throughout the region... With the invasion of Palestine by regular Arab armies believed to be imminent – once the British had finally left in eleven or twelve days' time – many Arabs felt that prudence dictated their departure until the Jews had been defeated and they could return to their homes. Some 12,000 Arabs, with some estimates reaching 15,000, fled Safed and were a "heavy burden on the Arab war effort". Among them was the family of Palestinian Authority President Mahmoud Abbas. The city was fully under the control of Jewish paramilitary forces by May 11, 1948. In 1974, 102 Israeli Jewish school children from Safed on a school trip were taken hostage by a Palestinian militant group Democratic Front for the Liberation of Palestine (DFLP) while sleeping in a school in Maalot. In what became known as the Ma'alot massacre, 22 of these school children were among those killed by the hostage takers after the school had been raided by a special forces unit of the Israel Defense Forces. Over 1990s and early 2000s, the town accepted thousands of Russian Jewish immigrants and Ethiopian Beta Israel. In July 2006, "Katyusha" rockets fired by Hezbollah from Southern Lebanon hit Safed, killing one man and injuring others. Many residents fled the town. On July 22, four people were injured in a rocket attack. The town has retained its unique status as a Jewish studies centre, incorporating numerous facilities. It is currently a predominantly Jewish town, with mixed religious and secular communities and with a small number of Russian Christians and Maronites. In 2008, the population of Safed was 32,000. According to CBS figures in 2001, the ethnic makeup of the city was 99.2% Jewish and non-Arab, with no significant Arab population. 43.2% of the residents were 19 years of age or younger, 13.5% between 20 and 29, 17.1% between 30 and 44, 12.5% from 45 to 59, 3.1% from 60 to 64, and 10.5% 65 years of age or older. The city is located above the Dead Sea Transform, and is one of the cities in Israel most at risk of earthquakes (along with Tiberias, Beit She'an, Kiryat Shmona, and Eilat). 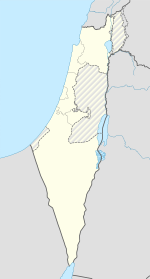 The last major earthquake to hit Safed was the Galilee earthquake of 1837. Safed has a Mediterranean climate with hot, dry summers and cold, rainy and occasionally snowy winters. The city receives 682 mm (27 in) of precipitation per year. Summers are rainless and hot with an average high temperature of 29 °C (84 °F) and an average low temperature of 18 °C (64 °F). Winters are cold and wet, and precipitation is occasionally in the form of snow. Winters have an average high temperature of 10 °C (50 °F) and an average low temperature of 5 °C (41 °F). According to CBS, the city has 25 schools and 6,292 students. There are 18 elementary schools with a student population of 3,965, and 11 high schools with a student population of 2,327. 40.8% of Safed's 12th graders were eligible for a matriculation (bagrut) certificate in 2001. The Safed Academic College, originally an extension of Bar-Ilan University, was granted independent accreditation by Israel’s Council of Higher Education in 2007. For the 2011-2012 school year, the college began a program designed specifically for Haredi Judaism. It was created in order to allow haredi women living in the Upper Galilee access to higher education, while still maintaining strict religious practice. The program accomplishes this goal through separate classes for male and female students. The classes are also taught during certain hours as to allow women to fulfill other aspects of their religiosity. In October 2011, Israel's fifth medical school opened in Safed, housed in a renovated historic building in the centre of town that was once a branch of Hadassah Hospital. The Livnot U'Lehibanot program in Safed provides an open, non-denominational atmosphere for young Jewish adults that combines volunteering, hiking and study with exploring Jewish heritage. Sharei Bina is a program for women who have just finished high school and want to study in a seminary in Safed for one year that teaches young women who want to experience Jewish spirituality in the mystical city of Safed. In comparison to other seminaries, Sharei Bina includes the study of the shekhinah and other Kabbalist rituals in the learning. 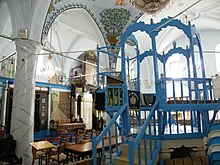 Safed is home to a large community of Jews who practice Kabbalah, a mystical form of Judaism. A strong tradition in mystical Judaism, reinforced by the central text of Kabbalah, the Zohar, maintains that the Jewish messiah will first reveal himself in the upper Galilee, which is where Safed is located. One practice of Kabbalah describes god with two faces, one is the shekhinah, which is described as the female aspect of God, while hashem is the male counterpart. Kabbalist thought tells that the womanly aspect of god returned to Safed when the Second Temple was destroyed and waits to be redeemed in this city. The tradition holds that when women connect with one another in the city of Safed, they awaken the shekhinah, which translates to the dweller within. One of the critical aspect of women's religious life in Safed is visiting the Safed Mikveh and Education Center, which holds the biggest and most up-to-date mikveh in the Northern part of Israel. This center is located on the spot that followers of Kabbalah believe Elijah the Prophet revealed secret information to the Holy Ari (Isaac Luria). The process of a woman immersing herself in the mikveh is a holy and spiritual process. The Education Center provides information and classes where women can learn about the experience and find it more uplifting rather than another chore on their errand list. The married women of Safed visit this mikveh in order to follow the monthly practice of immersing oneself after menstruation. The center is also a location to host events for women such Rosh Chodesh celebrations, which are common for women as they are responsible for celebrating the new month because of their menstrual cycle. The Safed Mikveh and Education Center has art and dance classes and also contains a room for women to gather in for henna parties for brides-to-be before their weddings. The Center also has a library for women to receive counseling about any issues they may have. The mikveh was created with much meaning because of the Kabbalist teaching about the shekhinah and achieving inner glory. In the 1950s and 1960s, Safed was known as Israel's art capital. The artists' colony established in Safed's Old City was a hub of creativity that drew artists from around the country, among them Yitzhak Frenkel, Yosl Bergner, Moshe Castel and Menachem Shemi. Some of Israel's art galleries were located there. In honor of the opening of the Glitzenstein Art Museum in 1953, the artist Mane Katz donated eight of his paintings to the city. During this period, Safed was home to the country's top nightclubs, hosting the debut performances of Naomi Shemer, Aris San, and other singers. Safed has been hailed as the klezmer capital of the world, hosting an annual Klezmer Festival that attracts top musicians from around the globe. Travelers will find an extensive Tourist Information Center in the Old Jewish Quarter on Alkabetz Street. The Center provides assistance to tourists who drop in to access information about the center, and for travelers who are planning a trip. Visitors can explore the places of interest, activities and historical sites when visiting Safed. Tourists may find the stories of legends of Safed to expand their understanding of the town and its history. Accommodations provide boarding opportunities for people of all ages and incomes and the list of eateries is extensive in the city. The Citadel Hill, in Hebrew HaMetzuda, rises east of the Old City and is named after the huge Crusader and then Mamluk castle built there during the 12th and 13th centuries, which continued in use until being totally destroyed by the 1837 earthquake. Its ruins are still visible. On the western slope beneath the ruins stands the former British police station, still pockmarked by bullet holes from the 1948 war. The Old Jewish Quarter takes the northern half of the Old City, and is where the bulk of the Jewish population used to live before the 1948 war. It is now also called the Synagogue Quarter due to its 32 synagogues. Here are its main tourist attractions. The two Ari synagogues are named after Rabbi Isaac Luria (1531–1573), commonly known by the Hebrew acronym "Ha'ARI", the Ari, formed from the initials of his byname, title and name, and which as a word mean "the Lion". The Artists' Quarter, situated in the pre-1948 Arab quarter just south of the Old Jewish Quarter or Synagogue Quarter, contains a large number of galleries and workshops run by individual artists and art vendors. Its "General Exhibition" presents a number of different representative artists, past and present, and is housed in the Late Ottoman (1902) Friday mosque known as the Market Mosque. the Mamluk mausoleum, now used by freemasons. The mausoleum was built for a Mamluk na'ib (governor) of Safed, Muzaffar ad-Din Musa Ibn Hajj ar-Ruqtai Musa Muzaffar (Mudhafar) al-din b. Ruqtay al-Hajj, who died in AH 762/AD 1360-1). Southeast of the Artists' Quarter is the Saraya, the fortified governor's residence built by Zahir al-Umar (1689/90–1775). Shlomo Halevi Alkabetz, 16th-century rabbi, kabbalist and poet perhaps best known for his composition of the song "Lecha Dodi". Moshe Alshich, prominent rabbi, preacher, and biblical commentator in the latter part of the 16th century. Jacob Berab, influential rabbi and talmudist of the 15th century best known for his attempt to reintroduce rabbinic ordination. Moses ben Jacob Cordovero, leader of mystical school in Safed in the 16th century. Shmuel Eliyahu, Chief Rabbi of Safed. Joseph Karo, 16th-century rabbi, and author of the great codification of Jewish law, the Shulchan Aruch. Isaac Luria, a foremost rabbi and Jewish mystic of the 16th century in the community of Safed in Ottoman Palestine. He is considered the father of contemporary Kabbalah. Ben Snof [he], Israeli vocalist. Moshe of Trani, rabbi of Safed from 1525 until 1535. Possibly the Biblical Woman with seven sons whose tomb is often said to be an ancient tomb discovered in the old cemetery of the city. ^ "Safed". Jewish Virtual Library Article. Retrieved 2012-01-07. ^ a b c d e f g Vilnay, Zev (1972). "Tsefat". A Guide to Israel. Jerusalem, Palestine: HaMakor Press. pp. 522–532. ^ a b c "Safed". Encyclopedia Judaica. 14. Jerusalem, Israel: Keter. 1972. p. 626. ^ a b c d e Drory 2004, p. 165. ^ "Tiberias". Jewish Encyclopedia. Retrieved 2012-01-07. ^ De la Fuente Salvat, Jose. "Palestina: ¿Existe o no? 2017"
^ "Planetware Safed Tourism". Planetware.com. Archived from the original on 2011-08-12. Retrieved 2012-01-07. ^ "Hadassah Magazine". Hadassah.org. Archived from the original on 2012-08-04. Retrieved 2009-05-06. ^ a b Drory, p. 163. ^ Howard M. Sachar,Farewell Espana: The World of the Sephardim Remembered, Random House, 2013 p.190. ^ Tyerman. God's War. p. 767. ^ Drory 2004, pp. 166–167. ^ a b Drory 2004, p. 166. ^ Bernard Lewis (1954). "Studies in the Ottoman Archives–I". Bulletin of the School of Oriental and African Studies. 16 (3): 469–501. doi:10.1017/s0041977x00086808. ^ Bernard Lewis (1954). "Studies in the Ottoman Archives—I". Bulletin of the School of Oriental and African Studies, University of London. 16 (3): 469–501. doi:10.1017/S0041977X00086808. ^ a b "Safed". Jewish Virtual Library. Retrieved 2008-10-25. ^ Keneset Yiśraʼel be-Erets-Yiśraʼel. Ṿaʻad ha-leʼumi (1947). Historical memoranda. General Council (Vaad leumi) of the Jewish Community of Palestine. p. 56. ^ "Ottomans and Safavids 17th Century". Michigan State University. Archived from the original on 2000-08-17. Retrieved 2008-10-25. ^ Abraham David; Dena Ordan (2010). To Come to the Land: Immigration and Settlement in 16th-Century Eretz-Israel. University of Alabama Press. p. 117. ISBN 978-0-8173-5643-9. Retrieved 24 October 2011. ^ Edward Robinson (1841). Biblical Researches in Palestine, Mount Sinai and Arabia Petraea: a journal of travels in the year 1838. Crocker and Brewster. p. 333. Retrieved 4 October 2010. ^ Morgenstern, Arie (2007). Hastening Redemption: Messianism and the Resettlement of the Land of Israel. Oxford University Press. ISBN 0-19-530578-7. ^ a b Sherman Lieber (1992). 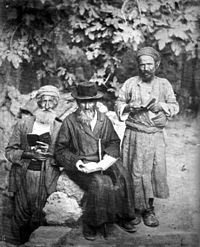 Mystics and missionaries: the Jews in Palestine, 1799–1840. University of Utah Press. p. 256. ISBN 978-0-87480-391-4. ^ "Arab Attack At Safed", The Times, Saturday, August 31, 1929; p. 10; Issue 45296; col D.
^ Martin (2005). Routledge Atlas of the Arab-Israeli Conflict. Routledge. ISBN 0-415-35901-5. ^ Sarah Honig (July 17, 2009). "Another Tack: Self-exiled by guilt". Jerusalem Post. Abbas is quoted as saying "People were motivated to run away... They feared retribution from Zionist terrorist organizations – particularly from the Safed ones. Those of us from Safed especially feared that the Jews harbored old desires to avenge what happened during the 1929 uprising.... They realized the balance of forces was shifting and therefore the whole town was abandoned on the basis of this rationale – saving our lives and our belongings." ^ a b "Safed". safed.co.il. Retrieved May 12, 2012. ^ In Israel, "Katyusha" became a generic name for most rocket launchers owned by Hezbollah. ^ Myre, Greg (2006-07-15). "2 More Israelis Are Killed as Rain of Rockets From Lebanon Pushes Thousands South". New York Times. Retrieved 2008-10-25. ^ Harriet Sherwood in Jerusalem (2012-11-04). "Mahmoud Abbas outrages Palestinian refugees by waiving his right to return | World news". London: The Guardian. Retrieved 2013-03-12. ^ "Table 3 – Population of Localities Numbering Above 1,000 Residents and Other Rural Population" (PDF). Israel Central Bureau of Statistics. 2008-06-30. Retrieved 2016-06-04. ^ "Climate data for several places in Israel" (in Hebrew). Israel Meteorological Service. May 2011. ^ "Weather Records Israel (Excluding Mt. Hermon)" (in Hebrew). Israel Meteorological Service. ^ "New Medical School to Open in Safed". Haaretz.com. ^ a b Dan, Joseph. A Very Short Introduction. Place of Publication Not Identified: Oxford University Press, 2006. ^ Ashkenazi, Eli. "An Inside Job?". Haaretz. Retrieved 2008-10-25. ^ Davis, Barry (2009-08-10). "You can take the music out of the shtetl". Fr.jpost.com. Retrieved 2012-01-07. ^ "Safed". Safed-home.com. Archived from the original on 2011-12-26. Retrieved 2012-01-07. ^ "Safed". Safed-home.com. Retrieved 2012-01-07. ^ "Accommodations of Safed Tzfat Zefat Tzefat Tsfat". Safed-home.com. Retrieved 2012-01-07. ^ Jodi Rudoren (November 4, 2012). "Palestinian's Remark, Seen as Concession, Stirs Uproar". The New York Times. Retrieved November 5, 2012. ^ Mansel, Philip (1995). Constantinople: City of the World's Desire, 1453–1924. John Murray. p. 185. ^ Eisen, Yosef (2004). Miraculous journey : a complete history of the Jewish people from creation to the present (Rev. ed.). Southfield, Mich.: Targum/Feldheim. p. 213. ISBN 1568713231. ^ "Miriam Mehadipur Gallery Safed". Zissil.com. Retrieved 2013-06-25. ^ "Mehadipur + Collection". Mehadipurandcollection.com. Retrieved 2013-06-25. ^ "La ville de Lille "met en veille" son jumelage avec Safed en Israël". leparisien.fr. 31 August 2015. Drory, Joseph (2004). "Founding a New Mamlaka". In Winter, Michael; Levanoni, Amalia (eds.). The Mamluks in Egyptian and Syrian Politics and Society. Brill. ISBN 9789004132863. Wikivoyage has a travel guide for Safed. This page was last edited on 1 April 2019, at 03:44 (UTC).